Today on the blog I am going to give you the low down on the revelation that pinups with Flesh Tunnels, Plugs, Stretchers (or whatever you like to call them) can now wear earrings! I KNOW! About 12 years ago, I first started to dabble with stretching my ears. I had never been a girly girl growing up and my earring collection was non existent. I loved alternative fashion and knew that tunnels were the way to go for me. I had limited success with the process. To be honest, I just flat ran out of patience with the whole thing. Then I met my Husband, who has zero chill and zero patience! Around 7 years ago, sat on the floor in our dingy Redhill apartment, armed with a jug of warm water, a towel and something for me to bite on, he stretched my ears...in one go. I went from pierced ears to 4mm tunnels in the same night. Please do not try this at home kids. It is not the way to go. It was excruciatingly painful, not to mention very stupid (having said that, Spencer stretched his ears with a Biro, so I got off lightly). Luckily, my tunnels have always been perfectly formed and (touch wood) I have never had any problems with them. Until recently. I found pinup in 2014 and I have fully embraced every single part of the lifestyle. The hair, makeup, clothes, shoes, jewellery. But something has been missing - earrings. I have often put an outfit together and the dress is right, the shoes match, my accessories and hair flowers work, but my earrings (my plain stainless steel tunnels), well, they just fall a bit flat! For ages, I have been browsing the internet, lusting after pinup and 50's style lucite earrings and wishing I could wear them. For a short while I even considered taking my tunnels out. Yet the uncertainty over whether after 7 years they would close back up into perfectly formed pierced ears made me change my mind. Then I thought, someone must make 50's style earrings for people with stretched ears...surely?! So on the off chance, I contacted they lovely Katy at Luxulite. Luxulite produce Lucite jewellery including brooches, earrings and necklaces here in the UK and they are a massive hit among the pinup community. I noticed that she catered for people needing clip ons, so I explained my situation to her and asked if she could produce a pair of her Hollywood Golden Age Glamour hoops, with a 10mm plug on the back. Katy came back to me really quickly, telling me it was no problem. She raised a custom order on Etsy for me and made the whole process really easy. I paid the standard charge for the earrings (£6.50), plus an additional £3.40 for the plugs, then the postage charge (£3.95). Katy explained that the dispatch would take a little longer as they were custom, but this of course was not a problem. About 1 week later, my earrings arrived. They were perfect. They fit my ears perfectly (something which I have had trouble with in the past). Yet the best part, was the fact that the earrings were fitted with beautiful silver glitter plugs, something I was not expecting! Katy used a silver glitter beveled tunnel on the back of the earring, which is really comfortable ans just slides right into place. The earrings themselves are really lightweight, so no extra security is really needed, but you could add a band on the back if you so desired. So for a grand total of just £13.85, I have joined the Luxulite club and I could not be happier. I now get the best of both worlds. 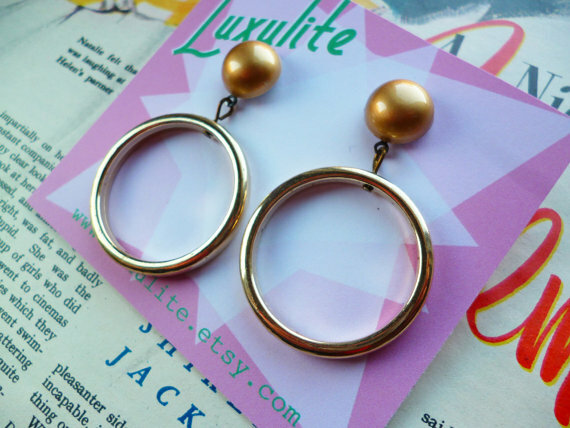 For everyday looks I can wear my tunnels, yet if I want to add a bit of sparkle and glamour, I can now reach for my custom Luxulite earrings. I am under no illusions that this will be my only purchase from Luxulite, as Katy did such a fantastic job. My only concern is which pair to buy next!!!! If you haven't done so already, check out Luxulite's awesome collection (including loads of fun Halloween inspired pieces) on Etsy.